The turning point of Mark’s Gospel is framed in by two stories about blind men.Mark often brackets stories or sections of his Gospel with similar material at the front and end of these sections, in a technique called an inclusio. For example, Mark places the cleansing of the temple within the cursing of the fig tree (Mark 11:12-25), where Matthew places the cursing of the fig tree after the cleansing of the temple (Matthew 21:12-22). These aren’t contradictory stories, but different literary aims and techniques. The goal of an inclusio is that the bracket sections and the inner sections mutually inform each other. The turning point in Mark, Peter’s confession of Jesus as the Christ and Jesus’ subsequent predictions of his impending death (Mark 8:27-10:45) is preceded and followed by two episodes concerning blind men. In Mark 8:22-26, Jesus heals a blind man, but the man’s sight is only partially restored; he sees, but not clearly. We cannot help but compare the blind man’s partial healing to Peter’s partial understanding of what it means to be the Christ. When Peter confesses Jesus as the Christ, he believes him to be the Rome-conquering kind, not the dying-on-a-cross kind. Like the blind man, he sees a blurry and incomplete picture. 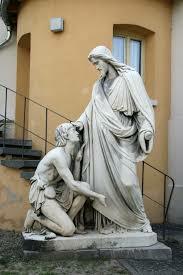 In Mark 10:46-52, Jesus heals blind Bartimaeus outside of Jericho. Bartimaeus is the ideal disciple in Mark, the one who truly understands what it is for Jesus to be the Son of David. He cries out, not for power or authority (10:35-45), but for mercy. He’s looking to the Christ not as a conquering king, but as the compassionate king. For this faith he is healed, and when Jesus tells him to go his way, the text tells us that Bartimaeus “followed [Jesus] on the way” (10:52). No one knows who Jesus is in Mark. They all think he’s the conquering king, which is why he silences crowds, individuals, and demons again and again. His disciples, though they see in part, don’t fully grasp what it means for Jesus to be the “upside-down” Messiah. Only blind Bartimaeus truly sees, knows, and follows. “Whoever asks of Jesus must be willing to follow Jesus … even on the uphill road to the cross” (James Edwards).